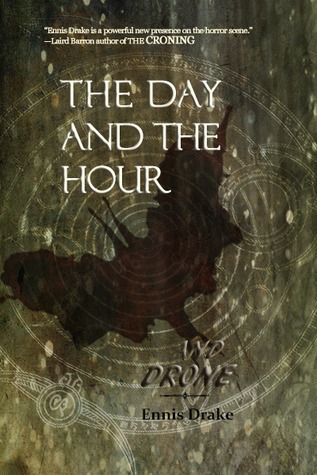 "The Day and the Hour & Drone" is a short book (roughly novella length) containing two stories by Ennis Drake, whose debut novel 28 Teeth of Rage I reviewed previously. As in his debut, Drake's strength is his artful, powerful prose, as well as the confidence with which he evokes perceptual distortion, hallucination or possibly insanity on the narrator's part. The longer and more ambitious of the two, "The Day and the Hour," features Jason Grae, a man tormented by his gift of sight and prophecy. Aware in advance of a series of seemingly connected catastrophies, yet unable to stop their cascade, Jason posesses the vision of a divine being along with the seemingly powerlessness of an ordinary man. "Drone" tells of another tormented soul, in this case the "pilot" or remote operator of a drone aircraft, a fighter in the long-distance conflict modern warfare has become. Both stories show Drake's improvement as a writer, and demonstrate ample proof of the confident, poetic style with which he's capable of drawing a narrative. This writing is full of unrestrained feeling, packed with visual detail and psychological resonance. Ennis Drake shows a dexterity of language and command of narrative that indicate he's on the verge of even greater things. This is a name to watch.